The eight RSCs work closely with the national schools commissioner Sir David Carter, who put in two appearances at this year’s AoC conference. He took part in a fringe session for sixth form colleges about academies, and addressed delegates from the main stage on November 15. In the first session, he answered questions about the recent AoC’s judicial review, in which it successfully claimed that Tim Coulson, the regional schools commissioner for the east of England and north-east London, had failed to follow the government’s own rules when initially approving the application. He admitted the outcome “raised question marks about whether our significant change guidance is robust enough”, adding: “I’m certainly committed to taking another look at that and want to work very much with the AoC around it”. Mr Coulson initially approved an application for the new school sixth form from the Loxford School Trust – which took over Abbs Cross in February – despite the school being rated ‘inadequate’ after its last full inspection in June 2015. The Department for Education’s rules state that sixth form applications should only come from academies rated ‘good’ or ‘outstanding’ by Ofsted, and should incorporate a 200-pupil minimum. The national schools commissioner was asked about the other academy sixth form – also run by Loxford Academy Trust – which appeared not to meet the guidelines. Braintree-based Tabor Academy’s sixth form, was approved by Mr Coulson at the same time as the application for Abbs Cross, and opened in September with a reported enrolment of just 17 pupils. “The Loxford-Abbs Cross-Tabor thing has been messy, and I think there are clearly errors that the trust made around consultation,” he told delegates. 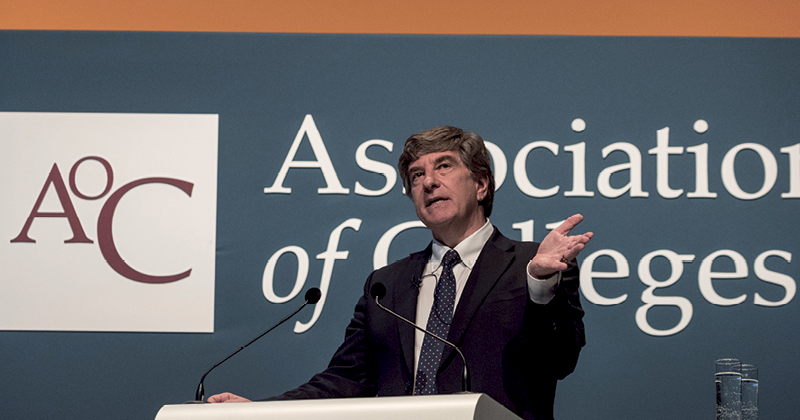 During his second appearance, the national schools commissioner posed eight questions for college boards about the future of their institutions. Sir David, who has previously been the RSC for the south-west, also spoke to sixth form colleges looking to join multi-academy trusts, and said that such a move should not be viewed as the be-all-and-end-all for improving education standards. He also indicated more future cooperation was needed between schools and colleges. While his speech suggested limited knowledge of FE, there’s little doubt of his pedigree with schools. Between 2007 and 2014, he held the role of chief executive officer of the Cabot Learning Federation, leading the growth of the federation to include 12 schools. Prior to this, he held the roles of headteacher of Cirencester Deer Park School in Gloucestershire, and principal of John Cabot City Technology College in Bristol. The overarching aim of the NSC is to support school leaders, teachers and governors across the education system in England. He is responsible for holding the RSCs to account, ensuring consistency in their decision-making, and developing and sharing the best school-improvement strategies. He also works to promote the benefits of being a member of a multi-academy trust, academy conversion and the free schools programme, and advises ministers on each of these topics. Finally, he monitors the growth of sponsors across the eight RSC regions and encourages potential new sponsors to come forward from schools, businesses and community partnerships. Meanwhile, according to the DfE, the RSCs have nine main responsibilities of their own. For academies and free schools, these are: advising on proposals for new free schools and their subsequent funding agreements; deciding on applications to make significant changes to academies and free schools; taking action where academies and free schools are underperforming; and intervening in academies where governance is inadequate. For local authority-maintained schools and sponsors they are: judging applications from local authority-maintained schools on whether they can convert to academy status; improving underperforming maintained schools by providing them with support from a strong sponsor; encouraging and deciding on applications from sponsors to operate in a region; and taking action to improve poorly performing sponsors. The RSCs are each advised by a headteacher board of four to eight members. Though these may include headteachers, former headteachers, trustees or business leaders, though they generally do not include FE representatives. In September, a judicial review invoked against the government by the Association of Colleges stopped an academy chain from opening up what would have been a very small sixth form at Abbs Cross Academy and Arts College in Essex. 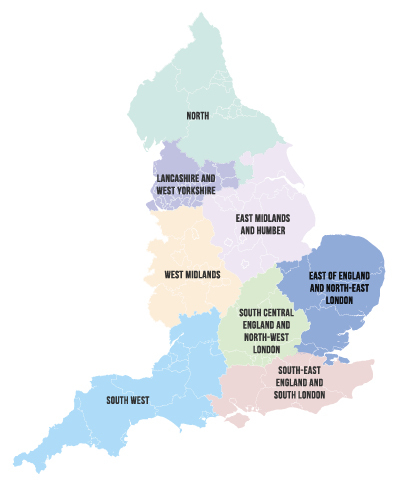 The government capitulated before the case went to court, casting a spotlight on the country’s eight regional schools commissioners, following the AoC’s claims that Tim Coulson, RSC for the east of England and north-east London, had failed to follow the government’s own rules. In May, Mr Coulson approved an application for the new school sixth form from the Loxford School Trust – which took over Abbs Cross in February – despite the school receiving an ‘inadequate’ rating in its last full inspection in June 2015. The DfE’s rules state that sixth form applications should only come from academies rated ‘good’ or ‘outstanding’ by Ofsted, and should incorporate a 200-pupil minimum. Despite this, FE Week discovered on November 4 that the Loxford Trust plans to go ahead with another new sixth form, this time with a potential student body of under 20, at Tabor Academy, also in Essex, another project approved by Mr Coulson. Concerns have also been voiced in south London, where the principals of Croydon College and Carshalton College have blasted plans to open the Harris Professional Skills Sixth Form, a 16-to-19 free school that will offer 230 places for professional skills courses and GCSE retakes. While the sector waits for a coherent line of action on these small providers, there has never been a more important time to familiarise yourselves with the RSC team that influences their creation. Above and to the right we introduce them all along with an account of the national schools commissioner’s comments at this year’s AoC Conference.